In Apple's third fiscal quarter ended in June, the company reported record revenue of $28.571 billion and record earnings per share (eps) of $7.79. Fueling the record eps performance was the record high 25.5% of each revenue dollar that flowed to the net income line. On July 24th I published an article titled Apple's Net Income Relative To Revenue Continues To Rise. In that article I reviewed the company's net income to revenue performance over the most recent eleven fiscal quarters. Today I'm continuing my analysis of Apple's quarterly results with a review of the company's operating expenses (OpEx) and the declining percentage of revenue consumed by its two components: Selling General and Administrative (GS&A) expenses and Research & Development (R&D) expenses. 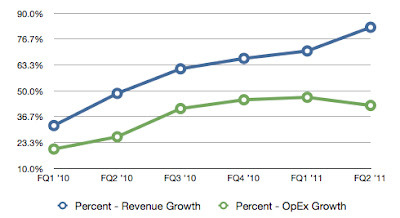 The graph below illustrates the differences in the rates of growth in revenue and operating expenses on a quarterly basis from FQ1 2010 that ended in December 2009 through FQ3 2011 that ended in June of this year. The difference in the rates of growth between revenue and operating expenses is unmistakable and the resulting benefit to net income and earnings per share is remarkable. Since the beginning of FY 2009, the percentage of revenue consumed by operating expenses has declined from a high of 14.35% in FQ2 2009 to a low of 8.90% of revenue in the recent June quarter (FQ3 2011). As revenue has scaled significantly higher over the most recent eleven fiscal quarters, the falling percentage of revenue consumed by operating expenses is now delivering literally billions of additional dollars to Apple's pre-tax income line on a quarterly basis. The drop in operating expenses as a percentage of revenue can have a bigger impact on Apple's net income and earnings per share than variations in each fiscal quarter's gross margins. The graph below illustrates the dramatic drop in the percentage of revenue consumed by operating expenses as revenue has risen significantly over this eleven-quarter period. On April 23, 2011 I published an article titled Posts At Eventide: AAPL June Quarter Trends To Track. In that article I mentioned several factors that will impact Apple's quarterly performances through the balance of the current fiscal year and throughout FY 2012 that begins in late September. Today I'd like to revisit each of these factors ahead of the release of Apple's June quarter results on Tuesday and following the recent rise in the company's share price. I maintain a $590 price target on AAPL. On Friday the shares set a record closing high of $364.92. However, this recent rise in the share price has only been a retracing of ground since the previous all-time closing high of $363.13 set on February 16th. For the June quarter I'm estimating a 70% rise in revenue to $26.619 billion and a 90% rise in earnings per share to $6.67. During the first six months of the current fiscal year revenue rose 76.2% and eps 83.2% over the corresponding prior-year period. Due to the influence of the Apple iPad for the first time in prior-year comparisons, I'm expecting a slight moderation in the June quarter's rate of revenue growth. However, the continuing decline in operating expenses as a percentage of revenue will favorably impact the earnings per share results. The graph below illustrates the rates of revenue growth versus the rates of growth in operating expenses for the most recent ten fiscal quarters. I expect net income to reach above 23.5% of reported revenue in the June quarter versus the 23.33% of revenue that flowed to the net income line over the first six months of the current fiscal year. 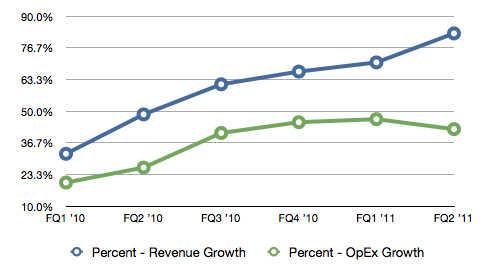 I also expect operating expenses to fall below 9.5% of reported revenue in the quarter. The Global Tablet Market: I've said several times outside of the Apple iPad, a global consumer market for tablet devices does not currently exist. While iPad unit shipments in the March quarter were below the expectations of most analysts due primarily to supply constraints, the tablet market is in a nascent phase of development. The Apple iPad will remain the undisputed leader in the tablet market well into CY 2012. The market can not at this time economically support a large number of potential competitors and Apple's global retail store presence is a competitive advantage competitors simply can not match. I estimate iPad unit sales in the June quarter of 8 million units, representing a 157% unit sales increase over prior-year sales. Constrained supplies of the iPad 2 will have a slight impact on the quarter's unit sales outcome. Moving forward into the September and December quarters, iPad supply constraints will evaporate leading to record revenue and earnings in the September quarter and FY 2011 revenue at or above $112 billion and eps for the fiscal year at or above $27.50. On Friday, Apple (AAPL) closed New York trading at 343.26, up $7.59 on the day and up $16.91 or 5.2% on the week. Although the week's share price advance was impressive, Apple remains significantly under valued based on the company's current rates of revenue and earnings growth. In the first six months of the current fiscal year Apple's revenue has risen 76.2% and earnings per share has gained 83.2%. In contrast, since the first trading of Apple's current fiscal year on September 27, 2010, the share price has responded with only a 17.9% gain. Last week in a post titled AAPL: The Coiled Spring I compared the median price targets for three popular equities: Amazon, Apple and Netflix and the share prices for each of these companies. Apple is trading at a price-earnings multiple of 16.35 times trailing 12-month earnings of $20.99 per share and at only 76.3% of the median Wall Street price target of $450 per share. In comparison, both Amazon and Netflix are trading at much higher price earnings multiples and at or near their respective median price targets. 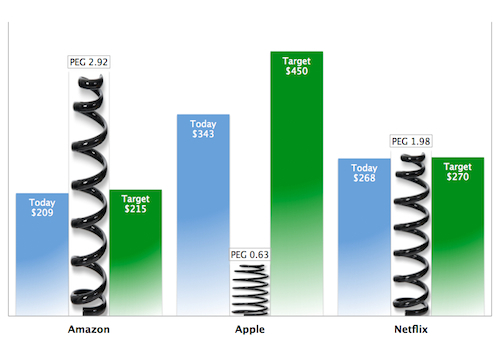 For today's post I asked Jeff Fosberg of the Apple Finance Board to adapt his popular "coiled spring" graphic to reflect not the price-earnings multiples of the above-referenced companies but the PEG ratios of the companies at Friday's closing prices. Simply defined, the PEG ratio represents the price-earnings multiple divided by earnings per share growth. The lower the PEG ratio, the lower the current valuation relative to rates of earnings growth. Apple's current PEG ratio is 0.63 versus 2.92 for Amazon and 1.98 for Netflix. Compared to high-flying stocks such as Amazon and Netflix, Apple is bargain priced and the company's current PEG ratio signals more share price gains ahead. Because Amazon, Apple and Netflix operate in different product and service markets, the PEG ratio is a more effective way to compare and contrast the current market valuations of the three popular equities than a comparison of price-earnings multiples alone. This comparison accentuates the deep discount to growth at which Apple currently trades.